CHICAGO (March 6, 2017) – In the preeminent U.S. observance of the 500th anniversary of the Reformation (Oct. 31, 2017), the Evangelical Lutheran Church in America (ELCA) Conference of Bishops’ Ecumenical and Inter-Religious Committee and the United States Conference of Catholic Bishops’ Ecumenical and Interreligious Affairs Committee gathered March 2 for a Lutheran-Catholic service of Common Prayer. The service followed the Common Prayer liturgical guide, developed for the joint ecumenical commemoration held in Lund, Sweden, on Oct. 31, 2016, co-hosted by The Lutheran World Federation and the Roman Catholic Church. During the service – in a significant moment that underscored 50 years of Lutheran-Catholic dialogue – a joint statement was presented and signed by the committee chairs, the Rev. 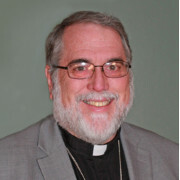 Donald P. Kreiss, bishop of the ELCA Southeast Michigan Synod; and the Most Rev. Mitchell T. Rozanski, bishop of the Catholic Diocese of Springfield, Mass. The statement mirrored the joint statement signed by Pope Francis and the Rt. Rev. Dr. Munib Younan, bishop of the Evangelical Lutheran Church in Jordan and the Holy Land and Lutheran World Federation president, during the service in Lund. The service also included the reading of five commitments found in “From Conflict to Communion,” a Lutheran-Catholic dialogue report. A candle was lit after the reading of each commitment. “Today can be the beginning of a new chapter of that relationship, where we can join together, celebrating all that we have in common, which is so much greater than what divides us, and figure out how then we are called to go out into the communities where we live and preach the gospel,” said Kreiss.